Editor Note(Update): Ashley Cain and Timothy LeDuc won the short program at the 2017 U.S. Championships January 18 with a score of 69.33. In spring 2016, Ashley Cain was a former U.S. Junior National pairs champion who had not competed in pairs for over 4 years. Tim LeDuc, former U.S. Junior National pairs medalist, had been out of competitive skating entirely for 2 years. Who would have thought this unlikely duo would form a new pairs team? Yet that’s exactly what happened. Cain and LeDuc had a tryout in May 2016 and instantly clicked as partners. They decided to team up, despite the time they’d both spent away from pairs. Tim soon joined Ashley at her training location in the Dallas, Texas area. Now, just 7 months later, Cain/LeDuc are rising quickly in the ranks of American pairs skating. Ashley and Tim have had a busy international season, competing at three ISU Challenger Series events (the most of any U.S. pair). They placed fourth at both Nebelhorn Trophy and Finlandia Trophy, and then won their first international medal (bronze) at Golden Spin of Zagreb. This week, Cain/LeDuc will compete at their first U.S. Nationals as a team. Ashley and Tim took some time recently to speak with me about their new partnership, their season so far, and their hopes for Nationals and beyond. It was such a pleasure getting to know this new pair! Ashley is bright, direct, and positive; Tim thoughtful and well-spoken. Although still a new team, Ashley and Tim seem very much on the same page, agreeing with each other’s comments and sharing some laughs, too. As they prepare to compete in Kansas City, both seem very clear on what they want and the direction they’re going as a team. Q: Ashley and Tim, let’s start with how you got involved in skating. Ashley, you come from a skating family, and started competing when you were 4. Even when you were a teenager, you always seemed really confident on the ice in front of a crowd. Do you attribute that to your background, your personality, or both? Cain: I think my personality has a lot to do with it. I’m very outgoing, and I’m very goal-oriented, so I try to apply that to my skating. The first time I skated, I was 2, on a canal in Canada with my family. After that, I was always at the rink with my parents when they were teaching, and I was always watching the older skaters. And I told my parents I wanted to do it. They never pushed me into skating; they allowed me to pick it on my own. So I started competing when I was 4. My dad was a pairs skater; when I was little, he would do lifts with me. And I started doing pairs when I was 7 or 8—just with my dad, and there were other pairs guys at the rink at that time, and I started skating with them. They took me through some of my pairs tests. My first time going to Nationals for pairs was in 2007. So this will be my 10th Nationals, which is crazy! (Laughs) I was a baby at my first one. Both of my parents were show skaters. So, from a very young age, they taught me how to relate to a crowd, how to really perform a program. We always had shows at our rink that my parents produced and put on. They always had me doing those. And I think that’s contributed to my skating now. Q: Tim, unlike Ashley, you began a bit later. You started skating when you were 12, and you didn’t begin private lessons until you were 14. For a skater, that’s definitely a late start. How do you think that’s affected your career—starting at the age you did? LeDuc: I think that, because I started later, I was a little bit older, a little bit more mature. Knowing that I wanted to skate for such a long time … the moment that I finally got to step on the ice and start skating … I really just took off from there. Within a couple months I was skating nearly every day, at a public skate, in rental skates. I did up to single Axel in rental skates! I think starting later was actually an advantage, because I was older, I understood my body a little bit better, so I jumped right in. Other skaters have started late as well and been quite successful. I watched Timothy Goebel when I was growing up. He was a huge inspiration for me, when he skated in the 2002 Winter Olympics and won the bronze medal. And I remember, on that broadcast, they were talking about how he started at—I think he was 11 or 12. And I’m like, “Oh, my gosh! He’s a boy named Timothy from the Midwest who started at a late age. Maybe I can do it, too.” Johnny Weir also started quite late. So it’s definitely been done before, and people have been successful. As far as my transition into pairs … I graduated from high school and was phasing out of singles. And a girl at my rink had just broken up with her pairs partner. She asked me just to skate with her, to keep her in shape while she looked for a partner. And I said, “You know what? I’ve always wanted to take my pairs tests, just to try it out and get some credentials for coaching.” So we ended up doing the first couple of pairs tests. And upon practicing more, we were like, “Hey, let’s give this a try. This is actually a good fit.” So we ended up competing at Nationals that season, in Novice. And then, after that, I knew that I wanted to skate pairs. I had an opportunity to go skate with Serguei Zaitsev [pairs coach] in Indianapolis. And that launched my pairs career. Q: I don’t know if many people remember this now, but you and Ashley actually competed against each other in Novice and Junior pairs at Nationals. Cain: (Laughs) Yes, we’ve actually known each other since Sectionals 2009. And then we competed against each other at 2010, 2011, and 2012 Nationals. In 2011, we made the Junior Worlds team together—Tim with Cassie Andrews, and me with Josh Reagan. And we ended up getting three spots back [for the United States] pairs teams for the next year. There had been a long drought with that; so we had this special bond between us. Q: Did you guys ever think, back then, that you might become partners someday? Cain: No. (Both laugh.) We had partners, and we were successful at the time with them. I think for any skater, you think about each season as it comes. You don’t really think that far ahead, into what maybe could happen. We were just friends. We were teammates. Q: So, after that Junior Worlds  …. Ashley, you went on for another year with Josh Reagan as seniors. And Tim, you started skating with DeeDee Leng. And then you both took a break from pairs skating for a few years. Ashley, you focused on singles from 2013-2016. Did you miss pairs during that time? Did you ever think you would go back to it? Cain: I always thought I was going to do singles and pairs. I always thought I would be that girl doing double duty. Just because that’s what I had done since I was a young kid; it was so normal to me. So when Josh and I split … Many people think it was because I wanted to focus on singles. No, that wasn’t the case. It was just personal between us, and we decided to go our separate ways. At the time, I felt lost, because it was very sudden. And I was not planning for it. So I relied on my singles career. Which was successful, especially that year, because I was 2nd in Juniors [Junior Nationals 2012], so I was looking at Senior B [events] for the next year, and that was all very exciting. So I focused on that for the next 3 years, and established myself as a singles skater internationally and nationally. But I did really miss pairs. I remember watching it at Nationals, especially, and sitting in the crowd, and watching all the [pairs] skaters that I had competed against. They were out there with somebody, sharing that special moment. I definitely did miss that. But, as you can tell … I’m taller. I’m also very experienced as a pairs skater. So I was going to have to find somebody to skate with who’s tall, who’s big, who can lift me, obviously. I think Tim came at the right time. It’s working out really well. We both have goals, and we’re working toward them together, and …. Cain: Yeah, Pokemon goals. (Laughs.) I don’t think I realized how much I missed [pairs] until Tim and I had our tryout. And we were doing lifts, and throws, and it was just such an incredible feeling. I was so happy. I could feel this huge smile on my face, because it just felt so good to be lifted and to be flying through the air again. Q: Tim, after 2014 Nationals, you took a 2-year break from competitive skating, and you worked on cruise ships and traveled the world. How did that break affect you, your skating, and your outlook on life? LeDuc: After the 2014 season, I was very burned out. And I was also out of funds to pay for my training. I felt very one-sided. So much of my identity was wrapped up in my ability to figure skate. And I was very fearful of not having other abilities and other things to do. And I let that fear sort of overwhelm me, so I got really burned out on the competitive side. But I still really loved to skate. And the opportunity to do cruise ships presented itself. I thought, “What a great way to experience more of life, travel the world, and still get to skate and do what I love.” My sister and I had started skating at the same time, and she joined me on the cruise ship. So I got to travel and see so many different countries with my sister, who started this whole journey with me. And, upon spending some time away from the competitive scene, and kind of pondering my career … I realized, in hindsight, that I was letting fear control so much of my life. Fear of failure. And I felt that if I was going to live up to my own [potential], I needed to face that fear. Somebody very close to me opened up to me about their experience with fear, and how it had controlled their life, and how it had taken away something very personal to them. And I didn’t want that to also be my story. It was through that inspiration that I decided to come back, after my ship contract finished in March 2016. I got back on big ice again …. Cruise ship ice is about a fifth of the size of competitive ice. I got back on big ice, and started skating, and said, “You know what, I’m going to do this. I’m going to try it again.” I’d been able to save up some money. “I’m not going to let fear control me. I’m not going to let that be my story.” After talking with [USFS’ Senior Director of Athlete High Performance] Mitch Moyer, he suggested that Ashley and I try out. We just kind of knew, I think, right away, that it was going to be a good fit. Within a few days, I had already packed up my stuff and moved to Dallas. And then we got right to work. Q: So, you guys teamed up and started back into training. Ashley, how difficult was it to switch your focus back to pairs, after being in singles for 3 seasons? Cain: Well, initially when we first teamed up, I was still going to do singles. So the first 2 to 3 months, I trained singles and pairs. Every day. Which was very hard. I thought it was going to be a little bit easier. It did not feel the same as it did when I was 16! It was much easier then—my body was younger. In September, we did Mid-Atlantics [a club competition in New York City], where I tried both. Because USFS said, “You’ve committed to both. We want to see you, at a competition, try both, and then make the decision if you want to keep doing singles and pairs.” So we did Mid-Atlantics. And I knew, as soon as I stepped off the ice after my singles long program, that I was going to give up singles. And it wasn’t too hard of a decision. Obviously, that night was very emotional for me. But I didn’t feel like I left it on a sad note; I had a great singles career. I made the decision that it was time to try this new journey. It was something I didn’t expect at the start of the season, at all. The transition [back into pairs] was not too hard … I was unsure if my body would remember the timing of a twist, or a throw, or if my body could really handle it, because I’d been 16 the last time I did pairs. But I think, initially, the only [problem] was that we were incredibly sore. Cain: It was incredible how sore we both were! There’s a huge difference in pairs and singles, in the sense of what muscles you use. We were coming into the rink so sore. And we were barely able to move, actually, at some points! Our arms were hurting so bad. But at the same time, it was so exciting, because we were always learning something new. Now we’re to the point where we can come in and do our elements and everything’s really consistent. And now we’re just training the programs. But still, we’re working on new things, and every day is pretty exciting. It’s obviously very tiring, but we’re having a great time. I’m so happy, and I’m having so much fun. LeDuc: Yeah, those first few couple of months, after getting back into pairs, was a trip. Ashley was training singles, and I was trying to get back into shape to do competitive programs after not having done them for 2 years. So that first couple of months was a journey. Cain: We had a bit of a time crunch. We started in late May. And we knew our first competition would be in August, because we needed to get programs out before the international season started. We had to learn all the elements–but we couldn’t get hurt. We couldn’t hurt ourselves in trying to run a program after just learning all these new elements. We had to do it in a smart way. We started the season thinking that we were going to Cranberry Open, to Mid-Atlantics, and then we’d be going to Sectionals and trying to make it to Nationals. That’s what we set ourselves out for. We weren’t sure about internationals, being such a new team. So to have 3 international [events], I think has helped us so much, because it’s pushed us to work harder. Q: Were you guys excited to get those three assignments? Cain: We found out at Mid-Atlantics that we had Nebelhorn. And then we got back from Nebelhorn, and we thought maybe we’d have another one. But we didn’t know it would be a week later. (Laughter.) After Nebelhorn, we took Monday off. We came back Tuesday, and I put new boots on. We got a call later on Tuesday saying, “You’re going out to Finland [for Finlandia Trophy]. You leave on Monday!” So I switched back to my old boots … We got back from Finland, we were home for a week. Then we got the email and call saying, “We’re going to send you to Golden Spin [of Zagreb].” It’s kept us in good shape, because we haven’t allowed ourselves to back off. Q: And now you’re heading into your first Nationals together this week. What are your goals at Nationals? And how prepared do you feel for this event? LeDuc: We work every day to push ourselves to the limit, so of course we want results in a competition. Of course we want to be on the podium. But we also understand that we are a new team, entering our 7th month together. So, our goal is really just to stay together as a team, to build on what we’ve done in each competition. Each competition, we’ve done everything a little bit better, so we want to continue that trend and feel like it’s another step forward. And if that puts us on the podium, awesome. Then that’s two goals accomplished. For me, personally, this is the first time I’ve been back to Nationals in a couple of years. Maybe this is sort of a cliché answer—but for me, personally, just to be at a U.S. National championships again is a big victory. Cain: We know, going into Nationals, that everybody’s going to be well-prepared. Everybody’s going to be fighting, and they’re going to give 100 percent. And at the end of each program, everybody’s going to be spent, giving it everything they have. And that’ll be us as well. I mean, everybody trains to be on the podium. Everybody trains to win. You know, nobody trains to be last. We know that going in. That there’s pairs who have been together way longer than us, who have way more experience than us. LeDuc: And they’re hungry for it. Cain: So we know we just have to go and stay connected to each other. And not let all these external factors play on our emotions, or make us feel a little bit exhausted by the end of the week. We have to stay connected to each other and within our coaching team, and just trust each other, and trust ourselves, and trust that we can push through this whole week. LeDuc: Do what we do every day. Cain: (Laughs.) Yes, the PC answer—just do what we do every day. Luckily for us, we’re not the only new team. There are quite a few teams that are new, or people coming back from injury, stuff like that. There’s going to be a lot of redemption skates, I feel, at this Nationals. 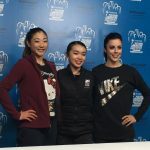 Q: What is the level of stress like, skating at Nationals, especially in seniors? LeDuc: Oh, man. Nationals is a mind game like no other. No competition is like U.S. Nationals, for the U.S. skaters. Cain: For me, the craziest thing [at Nationals] was being in that last warm-up [group] Olympic year –which we both were. We both had great short programs that year—Tim in senior pairs, and me in senior ladies–so we put ourselves into that last warm-up. And for me, that was a totally different experience than any other Nationals. You felt the pressure of everyone trying to make the Olympic team. You had all the emotions of everybody after they skated. And it almost felt like everyone was so close to the ice—like everybody was on top of you. It was a pretty incredible feeling. I felt so honored to be in that position among these top skaters. LeDuc: Nationals is also fun because it’s so intimate. Even though you’re out on this big stage, and there’s so many people there, it’s all familiar faces. Everybody is very well-educated in the sport, so everyone knows what’s going on. So it feels very intimate. In a way that an international competition, where you’re maybe not as familiar with the people, doesn’t. Q: Nationals has this extended-family feeling to it. Cain: Especially among all the senior skaters, you really feel like you’re part of this huge chain. Because you’re all there, and you’ve worked so hard, and it’s finally come to that time. And everybody’s good. Everybody’s made it to Nationals because they’re the top in this country. So everybody’s good, and everybody’s there to support each other. LeDuc: Yes. There is a wonderful sense of camaraderie among the athletes. Because we all understand what we go through every day, what we sacrifice, what we put our bodies through every day, just to be at that competition itself. Q: Let’s talk about your technical elements this season. You’ve changed your jump content a little bit throughout the season. You started off with side-by-side (SBS) triple Salchow in the short program, then switched to SBS triple loop at Golden Spin. And you’ve used a couple different SBS jump layouts in the long program. So what has been your thinking with the SBS jump evolution? And what jumps are you planning for Nationals? LeDuc: For Nationals, we’re planning the same technical content that we did at Golden Spin. We took that competition as a trial. Zagreb was a chance to put this layout out in competition and test it out. It worked well, and we felt comfortable with this layout. So we’re going to stick with the same planned elements for Nationals. As far as our evolution over the season … As a developing pairs team, things change constantly. You’re always figuring out what works for your partner, and what works for the team, and what fits best with the music. But as far as what we put in the program, it’s what we can do consistently and do well, so that we can hopefully have as clean a skate as possible in competition. Right now we’re training triple loop and double Axel/half loop/triple Salchow combination very well. So those are the jumps that we’re sticking with. We both have backgrounds in singles, strong jumping technique. We try to use that to our advantage and push the envelope technically. Cain: We can make up points in jumps. We’re both very strong jumpers, so we [can] gain points on that to match up to other teams that are doing a quad twist or a quad throw. Q: In the past, you guys shared video of you practicing SBS triple flips. Is that something that might go in your programs? LeDuc: I mean, we’re always looking to evolve and grow as a pairs team and add new technical content. But the difference, points-wise, between a triple loop and a triple flip is very minuscule—just 0.2 points. And we can do a loop more consistently than a flip. That [extra] .02 points isn’t worth it for us at this time. But things can always change in the future. Cain: For the off-season, we’re going be working on all our jumps, and maybe triple/triple combos. That’s definitely off-season work. Because right now, we don’t want to overwork our bodies with trying things we don’t need right now. But in the off-season, when we’re not running programs, we’ll work on jumps, new lifts, new positions. Q: Speaking of new elements, what are your thoughts about the trend toward quad elements in pairs? Is trying quad elements something that you see in your future? LeDuc: Putting together a new pairs partnership, you have to triage everything. You have to give attention to what needs attention most at the time. Quad elements are not on the list right now. We’re just trying to get our body lines to match and everything to fit within the time limit of the program. So that would be a question for the future. Cain: Yes. Where we lack in quad throws or twists, we make up in our jumps. So right now, we don’t necessarily need that. But I applaud any girl who goes after a quad, and the boy who throws her, or tosses her up in the air. I bow down to every girl who does that, because that takes a lot of guts. Triples are hard enough. (Laughs.) So I applaud them. Who knows? In the future, we could have an epiphany, and it could work. Q: You started the season competing the double twist. Then you upgraded to triple twist at Golden Spin. Can you talk about your progress with the twist element? Cain: Twist was the last thing we got. We did all of our throws, all of our lifts, everything [else] first. Then we got to work on the double twist. With Josh [Reagan], I never did triple twist, I only did a double. Tim had done triple twist with DeeDee [Leng]. So he knew the feeling of it; I had no idea what the feeling would be. So we left it as a double, hoping [it] would evolve and get bigger, and our timing would get better. Then, about a week and a half before Zagreb, we started work on the triple twist. And we got it! We ran it in the long program about 4 times before Zagreb. We planned on doing a double twist in the short and a triple twist in the long at Zagreb. Then we got there, and the twist was feeling really good. It was getting up a little higher. We both looked at our coach and said: “We want to try it in the short. We think it would be really beneficial for us. We think it would put us in almost a different class … They’ll look at us different.” You know, there’s a big difference between doing double twist and triple twist in competition internationally. Especially when everyone’s doing a triple. So we said we’d do it. Cain : And we did it. LeDuc: We stayed on our feet. Cain: It got base [level]. But the fact that it had a 3 next to the Tw [on the scoring protocol] was a big step for us. That showed us how strong we are as a team and how connected we stayed. And now [the triple twist] is becoming more consistent. Obviously, it’s not going to look like Alexa/Chris’s this year. Cain: But it’s a triple, and we’re doing it consistently. Hopefully in the future, we’ll have a completely clean catch. LeDuc: We’re very happy with it. Cain: We’re very happy with it. I think that was our biggest step—getting a triple twist—that was our last thing. We knew that we couldn’t go international, expecting to podium, or go further than Nationals, without a triple twist. We knew that we’d have to have it. Q: Since you mentioned it earlier … What is it like when you fall on a triple twist? Cain: Yeah, it’s so fast. You have so much momentum. And I’m really tight in the air, so if we fall, I’m still spinning. It’s almost like a body slam. You just come down hard. You just slam into each other, and there’s all this force. It jolts you at first. It doesn’t really hurt afterward, I would say. But it jolts you —like, I need to get my breath back. It comes with the territory of being a pairs skater. You know there’s going to be falls. Q: Did you wear a lot of pads when you were first trying the twist and other elements? Cain: I don’t like wearing padding. For me, it almost tricks my mind into thinking: “Oh, I’m going to fall. That’s why I need the padding.” So I’ve actually never worn padding. Even when I was learning new jumps [in singles], I never wore the padding. It tricks my mind into holding back. Maybe in the future, if we’re going to try a quad or something like that, I’ll definitely wear padding. But in the air, when I have padding on, it feels like I have too much weight on me. I don’t like wearing it. I like going for it, and if I fall, or hit something—it’s okay. There’s going to be a bruise, but it’s okay. Q: I guess that’s kind of the mentality you need as a pairs girl. Q: It seems like lifts and throws have come—I’m not going to say easily—but it seems like you’ve gotten these elements into your repertoire pretty quickly as a new team. LeDuc: I think that’s because we have a lot of experience in pairs. So it’s not like we’ve never done these elements before. When you team up with somebody new, you have to learn their timing and technique. Once we figured that out, we came together quite well on those elements. Cain: We’re both equally strong, especially on lifts. We know where each of us has to be, what each has to do. We each have a job during the lifts. I’m not just going dead weight on him, and making him lift me. We’re both equally strong skaters. LeDuc I think it’s really important in the lifts that the girl be exceptionally strong, to hold herself. Otherwise the man is left to just hoist the girl into the air. But Ashley’s a rock star at lifts. Cain: Because I’m a taller girl, I know that I have to help out the guy a little more. Because I’m not this itty-bitty, tiny girl who can be lifted like a feather. So I have to help. I’m taller; the boy is going to have to get lower on the takeoff, because there’s more to go. I know that. I’ve been a tall pairs girl since I was 14; it’s no different now than it was then. I’ve known what my job is on that for a while. Q: Speaking of strength, what is your off-ice training regimen? Cain: I do a lot of high-intensity interval training workouts. A lot of cardio, especially now that we’re into the season. I’m not looking to build a ton of muscle; I’m looking to stay lean and keep my endurance up. And we do a lot of recovery. We both go to physical therapy, which helps tremendously. And we do lifts before we get on [the ice], and sometimes afterward. We work on twists on the floor. Flexibility, stretching. We’re doing a lot of work on the ice right now, running programs, and then resting afterward. LeDuc: When I trained with DeeDee, I would go to the gym for 2 or 3 hours every day after we skated. I would run 5, 6, 7 miles every day. Because I thought that’s what I had to do, and I was basically running myself into the ground. So I train a little bit differently now. I’m older—I’m 26, going to be 27–and my body is not what it used to be. So for me, it’s about maintaining the strength that I have. And stretching and doing core work. But mostly maintaining strength. Q: This season, you chose “I Put a Spell on You” for your short program and “The Prayer” for your long program. What drew you to that music? LeDuc: Ashley and I have a couple of different strengths that align. We both have this sort of fierce, sassy side. And we both have a very long, lyrical line. We wanted to capture both of those qualities. So for the short program, we wanted something a little bit sassier. We felt that “I Put a Spell on You” was a good match. The free skate to “The Prayer” is about showing off our long lines and elegance. That’s our mindset in how we chose the programs. Q: You worked with Serge Onik on your choreography this year. How did you guys choose Serge, and what has it been like to work with him? Cain: When Meryl Davis was on <em>Dancing with the Stars</em>, Serge was the choreographer who oversaw all the programs and taught some of the choreography. Also, he competed on <em>So You Think You Can Dance</em>. Meryl came in contact with Serge, and thought the way he related to the dancers, and the energies that he created, and the way he moved and breathed throughout the performance, could be great [for] figure skating. She talked to Mitch Moyer about maybe bringing Serge to work with some of the ice dancers. So Serge worked with them, especially in last year’s off-season, because hip-hop was going to be the new dance for the year. [One of this year’s set rhythms in the short dance.] Then Mitch brought Serge to Champs Camp to work with the other skaters. When we started, Mitch said, “I think Serge Onik would be a great fit for you guys.” He just thought our energies would be great together—which they were. So Meryl Davis brought Serge into the skating world, and now he’s working with all the ice dancers, and with us. We had a program after 2 days, because we worked so well with each other. He always has such a positive energy about him, and he’s teaching us different ways to move on the ice. It’s exciting; it’s something new. Q: Is there ever an issue with the fact that he’s not a skater himself? Cain: He’s worked with a lot of skaters over the past year, so he understands how we’re supposed to move. We were his first pairs team, so we showed him some videos of ways we needed to move into an element or do a setup for an element. We explained all that to him. Q: I like the work that he’s done for you guys. I’ve seen a lot of positive fan feedback about your programs, and it seems the judges have responded to them, too. Cain: Yay! I’m happy to hear that. Since Zagreb, we’ve worked a lot on our transitions. So hopefully, people can see a big difference at Nationals. Q: Speaking of transitions … You’ve already developed a distinctive look to your skating, with a lot of extended, or hyperextended, positions that you do in unison. LeDuc: We both have always been quite flexible skaters. I started doing a Biellmann the moment I stepped on the ice when I was young, because Evgeny Plushenko did it, and I wanted to be just like him. I’ve always had the natural flexibility, and Ashley obviously is bendy for the gods. (She laughs.) When we talked about our pairs team and how we [would] market ourselves—what our strengths are, what we want to highlight– flexibility was way high up on the list. It’s just something we work on every day. Obviously, 7 months into a partnership, our leg lines aren’t going to match perfectly every single time. But it’s something we’re actively pursuing—just making sure those hyperextensions do match up, so it makes the best look on the ice. Q: It gives you a little bit different, and sort of special, style compared to a lot of pairs. Q: Here’s a question about the future. Looking forward, what direction would you like to take your skating in future years? Cain: Right now, we’re just thinking of Nationals. Obviously, our goal is Olympics. I think every pairs team competing in this event, that’s their goal. We want to make the Olympic team. And we want to make the World team, and the Four Continents team. Those are our biggest goals right now. Looking into future years, after this Olympics, you never know what could happen, if we continue skating, or what. But for right now, we’re thinking of just this year. This week. LeDuc: We want to have a perspective that encompasses our future and our long-term goals. However, this week, everything is becoming so laser-focused on just achieving our goals at Nationals. That’s where we’re at right now. Cain: We also want to do some tours. Like Mao Asada’s THE ICE tour, Stephane Lambiel’s show, all of those European and Japanese shows that the top skaters get to do in the off-season. LeDuc: We would love to be a part of that. Cain: Yes. We’d love that. That’s something that we hope will be in our future. Q: I wanted to ask which skaters, or pairs specifically, you’ve looked up to, or been inspired by, as you were coming up in the sport. Cain: Coming up, I was always inspired by Michelle Kwan. I watched her live one year at Nationals, when I was really little. And ever since then, I’ve been completely in awe of her, and her skating, and her consistency. But when I started pairs skating, my biggest role model was Aliona Savchenko. Just because she’s incredible. Her body—the way she skates—how strong she is. Ever since I started pairs, she’s been my role model. LeDuc: I started skating because I watched the 2002 Winter Olympics. So, the star athletes of those Games were big inspirations for me. Michelle Kwan has always been a huge inspiration. Not just because she’s such a great champion and such a consistent athlete, but because she always set herself apart from the other skaters, I felt, because she skated with such passion. You really got to see her heart when she skated, and that was such an admirable quality, and I was so inspired by that, growing up. I always wanted to be that skater who sort of lost themselves in their art while they were still doing incredibly athletic tricks on the ice. Michelle, and Timothy Goebel, and Sarah Hughes from those 2002 Olympics. Those were my big inspirations growing up. Q: Ashley, you come from an international family, but you’ve lived in Texas all your life. And I saw from your bio that you like country music, and you’ve been to rodeos and stuff. Do you consider yourself a true Texan? Cain: Yes. I do now. When I was younger, I always wanted to live in a place like California or Florida, somewhere with a beach. But as I’ve gotten older, I’ve really appreciated Texas. My boyfriend’s family has a ranch, so in the past year alone, I feel like I’ve become more Texan. Because we go out to the ranch, we ride dirt bikes and four-wheelers, ride horses—all that stuff that Texans do. So now I kind of think of myself as a Texan girl. I love living in Texas now. I think when I was younger, you have all these places that you want to live and everything looks so much better. But as I’ve gotten older, this is home, and it’s nice to come back after every competition or trip. As for other things … I coach a lot. I have about 10 students right now. And I love that, it’s great. Q: I saw from your bio that you’ve attended Texas Tech University. Are you still going, or are you taking a break now? Cain: I went to Texas Tech all through high school. I did their K-12 program; it’s all online. I got good grades, so I received a scholarship from them. When I was just going to do singles this year, there was going to be enough time to do college as well online. But then, it just kept getting pushed back. Texas Tech has said I can keep my scholarship. It’s definitely something I’m looking to do in the future. Obviously financing will come into play, because it’s going to be expensive. Q: Tim, you’re into outdoor activities like paddle-boarding and kayaking. Have you been able to pursue that in Texas? LeDuc: Yes. (Laughs.) I’m a big fan of sleep. I try to get a good 9 or 10 hours every night. Q: You need it, with what you’re doing. LeDuc: Yes. And I’m not as young as I used to be, so it’s even more important at this stage. But Texas is great so far. The winters are much easier to get through here, so I’ve really enjoyed that. Cain: We’ve also taken him to a few Texas things. LeDuc: I’ve been to my first rodeo. A line-dancing bar. Yes, I’ve slowly gotten into the Texas spirit. Q: So, one last question for each of you. What is your favorite—or least favorite—thing about competing? LeDuc: Oohh, good one. (Silence.) Hold on, let me gather my thoughts. LeDuc: Competing is a stress like no other. But I do love the rush when you go out and you take on the challenge in front of you, head-on, and you skate a program you’re proud of. There’s really no satisfaction quite like that. When you know that you’ve pushed through the adversity and come out on the other side of the competition, feeling very accomplished. When the competition is over. Yes, that’s my favorite part. (Laughter.) When you’ve done a good job. Cain: Yes. I’d say that’s my favorite part too. When you’ve gone out and you’ve done everything you can, and you’re getting off the ice exhausted. But you’re coming off the ice to a big hug from your coaches. Or a hug from Tim, now. Before, when I was a singles skater, it was just my coaches. But now, it’s nice to look over, and Tim’s there. But I would say my least favorite thing about competing is you can have one bad performance, and people say the worst stuff about you. Sometimes you give it everything you have, and it doesn’t work out the way you want. People aren’t nice about that on social media. You see it and you can try not to look at it, but you know it’s there. So I would say that’s one of the hardest things about competing. You put yourself out there to get judged–and you don’t know how people are going to react. But we know that if we’re doing what we love, it’s all worth it. I love that feeling when you finish a great program, and the crowd is standing and the energy is pumping. And you can’t even explain it and you’re asking yourself, “Wow. How did I just do that? How did I do it?” And you really don’t know. Because your body just kind of went on auto-pilot, and it did what it knows to do. Q: That must be an incredible feeling. Ashley and Tim, thanks so much for taking the time to talk with me! Everybody is looking forward to seeing you at your first Nationals together, and I wish you the best of luck there! Cain and LeDuc: Thank you! Note: Ashley and Tim take the ice for their short program at Nationals in Kansas City at 4:30 p.m. CT on Thursday, January 19, 2017.